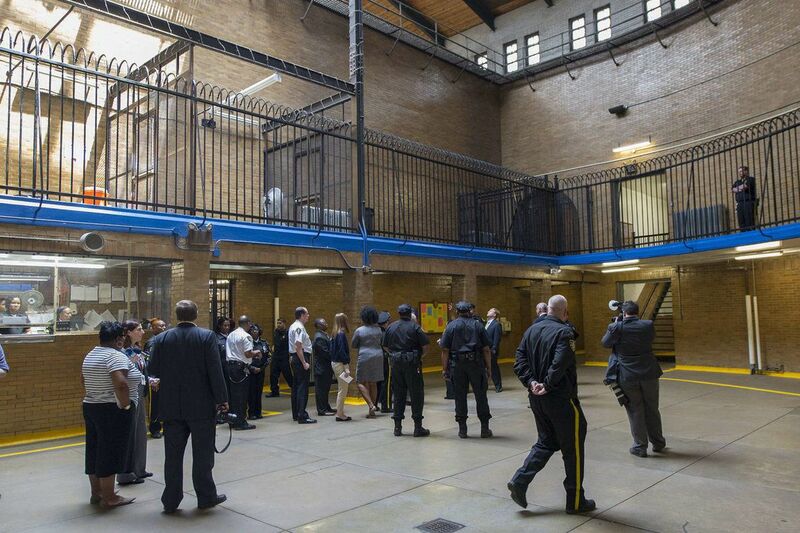 An interior view of the House of Correction seen in a 2016 file photo, when Mayor Kenney planned (then abruptly canceled) a media tour of the facility. Just a few years ago, Philadelphia officials were planning to spend millions of dollars on a new prison to replace the oldest city-run facility on State Road, the crumbling, 91-year-old House of Correction. Now, amid a concerted effort to shrink the city jail population by one-third over three years, they intend to simply close the prison instead. On Wednesday morning, city officials announced plans to close the jail by 2020. "Reaching the point where we can shutter this facility once and for all, without needing to build a new prison, this is a milestone," Mayor Kenney said. He remarked on the symbolic weight of the announcement, as Philadelphia's justice system remains in the national spotlight for the arrest last week of two black men sitting in a Center City Starbucks. "We are committed to equity. We are committed to fairness, and we're committed to changing the narrative of how people are viewed and how people are treated in this city and hopefully this country." The jail currently houses just 199 inmates in its 666 cells, according to the current prison census. Systemwide, the jails hold 5,500 people — down 26 percent since the reform initiative was announced two years ago. That's a population level not seen in Philadelphia since the 1990s. Kenney said in the same time that the jail population was reduced, major crime also fell by 3 percent. Germel McClure, 24, who spent a month this winter at the House of Correction on $50,000 bail for a gun-possession charge, described the facility as "a dungeon." "It was terrible, worst living conditions ever. It wasn't even decent. The showers were broken, the ceiling collapsing," he said, describing mice skittering across the floor of his cell, frigid temperatures, and mold in the vents. During his stay, he heard another inmate was rushed to the hospital after part of the ceiling fell on him while he showered. Despite its age, Prisons Commissioner Blanche Carney said the House of Correction would not be demolished. Instead, the city is undertaking a planning study to determine the best use for the facility going forward. Officials said that they did not yet know how much it would cost to maintain the jail but that demolishing it would cost millions of dollars. The news conference preempted a push from anti-incarceration activists who were planning a campaign called "Close the Creek" (as it's informally known) around shuttering the facility, and demolishing it for good. "We plan to challenge them on this timeline," Reuben Jones, a member of the No215Jail Coalition, said. "We also want to hold them accountable for not expanding electronic monitoring, [and to get them to] commit to reducing the overall county jail population by half and invest the savings in communities impacted by mass incarceration." So far, the city has reduced its reliance on electronic monitoring even as the jail population has declined, pretrial services director Michael Bouchard said earlier this year. The announcement also comes in advance of City Council budget hearings for the Department of Prisons, which spent $26 million on staff overtime in the last year despite the reduced population. Councilman Allan Domb has been particularly critical. "We're not seeing as a city the corresponding savings we should be seeing," he said in an interview in March. In a statement praising the announcement Wednesday, he said he wants to see the prisons budget reduced by 15 percent a year, or $48 million. But since well before he took office, Mayor Kenney has insisted the jail should be closed. Originally built in 1874 — then razed and reconstructed from the same stone in 1927 — the House of Correction has no sprinkler system, automated locks, or air-conditioning. Exposed pipes, officials told Billy Penn in one of the misery tours the city offered reporters in 2015, make for plentiful potential weapons. On Wednesday, Councilman Curtis Jones Jr. described the conditions there as "inhumane." "You lay there soaked in sweat, just laying on a bare mattress," a former inmate told the Inquirer in 2015. "You see cockroaches running up the wall, mice running across the floor. That alone is enough to make you want to stay out of jail." In its original design, the jail did not include space for rehabilitation and restorative programming, Carney said. "This gives us an opportunity to provide services that were either limited or unavailable due to our space constraints at the House of Correction." A view of the House of Correction in 2016. The reduced jail incarceration rate was achieved through reforms including faster case processing, reduced reliance on money bail, and expanded diversionary courts, Municipal Court President Judge Marsha Neifeld said. City officials previously had said closing the facility would not be possible until the jail population fell to 4,800 people. On Wednesday, they said that is still the benchmark, because the House of Correction's medium-security inmates can only be transferred to facilities with similar security levels. The closure leaves five other facilities on State Road. The second-oldest, the Detention Center, dates to 1963. The city jail population could further decline if proposals to end the use of money bail are realized. District Attorney Larry Krasner said he's committed to continuing that downward trend. "When you stop charging things that shouldn't be charged, and you stop asking for bail from poor people for nonserious offenses that they can't pay, you're going to see a reduction," he said. "So we have been delighted, rather than engage in a tug-of-war with all the people up here who have done so much to reduce the prison population, to be a willing partner."